Non-Skid Deck Cleaner with PTEF is the most effective and easiest way to clean textured fiberglass or painted decks. The special chelating agents loosen dirt and spills without the need for heavy scrubbing. The PTEF polymers provide a barrier against future stains, making clean up a breeze. It also is ideal for cleaning non-textured areas as well as all fiberglass, vinyl, plastic, metal or rubber surfaces. -Cleans away ground-in dirt and stains. -Safe to use, contains no harsh chemicals. -No hard scrubbing or rubbing. -Will not remove wax or polish. -A very effective, all-surface cleaner for fiberglass, vinyl, plastic, metal and painted surfaces. Wet deck with water. 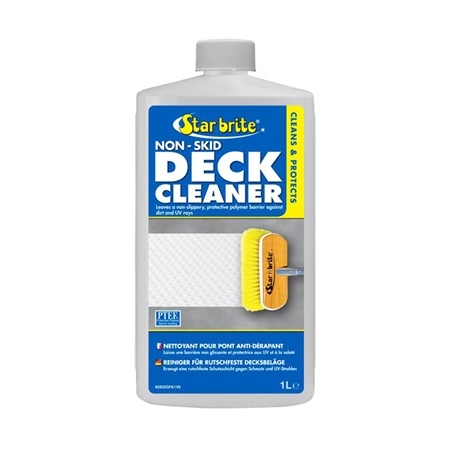 Squirt Star brite Non-Skid Deck Cleaner over surface to be cleaned and spread evenly with deck brush. Allow to sit for 2-3 minutes. Scrub treated area with deck brush and then rinse well. Allow cleaned area to air-dry. Extremely dirty surfaces may require a second application. The days are getting shorter and the nights are getting longer. The clocks have gone back again lulling us into a false sense of security with an ‘extra hour’ in bed...It must be that time of year again. The end of British Summer Time. The beginning of winter and laying up your boat. But what does “Winterisation” mean? Winterisation or “laying up” is the process of preparing your boat to withstand the winter weather. Although winters in the UK haven’t been as extreme in recent years as they were in the past, this is still an important part of your boat maintenance in order to prevent damage and ensure a smooth and problem- and worry-free return to sailing come spring-time.